Part 1. Interview with Dr. Edgar J. Gunter on Melvin Prohl’s work, 2018. Part 3. Dyrobes demonstration of Melvin Prohl’s paper, 2018. The existing methods for determining critical speeds are subject to the following limitations: On the one hand the methods that are general, i.e., that permit the calculation of higher critical speeds as well as the fundamental, involve computations so complicated as to be impractical for any but the simplest of rotors. On the other hand, the methods for which the computations are comparatively simple, such as the familiar methods of Rayleigh and Stodola, lack generality in that critical speeds other than the fundamental cannot be definitely determined. 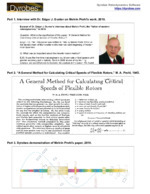 The calculation method presented in this paper combines generality with comparative simplicity. Any critical speed – first, second, or higher – may be calculated with equal ease. The rotor may have any number of spans and its cross section may vary in any prescribed manner provided circular symmetry is maintained. Any number of disks or symmetrical masses may be attached. The shaft journals may be considered to be elastically supported in the bearing with respect to both deflection and tilting of the journals; the elastic constant must, however, be symmetrical. The so-called “gyroscopic effect” associated with the moment of inertia of the disks on the rotor may be readily taken into account.